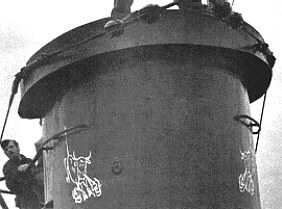 After Günther Prien was lost aboard U-47 on 7 March 1941, the flotilla that U-47 had been assigned to - the 7th U-Flottille – issued a written order to the U-boats belonging to the flotilla to paint the snorting bull insignia on the towers of their U-boats. As a consequence, the snorting bull became the official flotilla insignia of the 7th U-Flottille. Any U-boat with the bull would therefore belong to that flotilla. This order was intended to honour Prien, the legendary 'Bull of Scapa Flow'. News of his death was deemed to be such a blow to the German nation's morale that it was not announced until 23 May 1941. Although the official announcement wasn't made until this date, the 7th U-Flottille were clearly aware of Prien's demise soon after it happened. To prove this, one only needs to look at photos of U-69 returning from her 3rd patrol with a unique version of the bull adorning the conning tower. U-69's 'bull', which shall be discussed later, was applied before the 3rd patrol commenced on 5 May 1941. It follows that the order given by the 7th U-Flottille must have been issued some time before the official announcement of Prien's death to the German public. Some of the 7th U-Flottille boats had one bull located at the front of the tower, but most had two bulls (both facing forward, one on each side of the tower). Many U-boats had the snorting bull flotilla insignia in addition to their personal insignia. 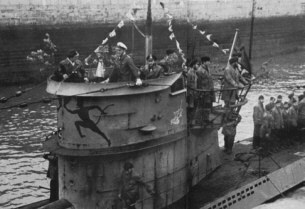 Examples of famous U-boats which sported snorting bulls in addition to their own personal insignia would be U-94 and U-552. 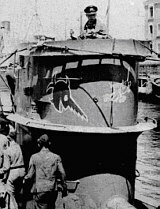 Earlier in these boats careers, before the order to display the bull flotilla insignia had been given, both U-94 and U-552 sported only their personal insignia. The port side of U-552, commanded by Endrass' close friend Erich Topp. Topp's red devil personal insignia is at the front of the tower, while a small snorting bull at the rear of the tower bulwark indicates that the boat is part of the 7th U-Flottille. A similar red devil and bull were present in the same locations on the starboard side. The well-known movie Das Boot is based upon the novel of the same name by Lothar-Günther Buchheim. When writing the classic novel, Buchheim drew upon his experiences aboard U-96 during her 7th patrol, which lasted between 27 October 1941 and 6 December 1941. During this patrol U-96, commanded by Heinrich Lehmann-Willenbrock, sported a snorting bull on either side of her conning tower. In the fictional film of the same name however, U-96 is adorned with a swordfish on either side of the boat's tower. If the filmmakers had wished to be historically accurate, depicting U-96 as she really was during the latter stages of 1941, two bulls should have been used instead of two swordfishes. Only later would the swordfish, as the personal insignia of Heinrich Lehmann-Willenbrock, appear upon U-96. At some stages later in U-96's career, the bull flotilla insignia was retained in addition to the personal swordfish insignia. At other times only the two swordfishes were present. Left: Taken by Lothar-Günther Buchheim during U-96's 7th patrol, this photo shows that U-96 sported two snorting bulls during this patrol rather than the two swordfishes that can be seen in the film Das Boot. Right: U-96 later in her career, sporting one bull flotilla insignia in addition to Heinrich Lehmann-Willenbrock's personal swordfish insignia.